Best Electric Shaver Guides: What To Look Out For? Man has evolved from the days of using traditional razors for shaving. Technology has made using manual devices, a stressful and mundane task. With the advent of electric shavers, the task of shaving has been made faster and much easier. But you cannot just stroll into a shop a get an electric shaver without considering some vital factors. This includes the price, durability, performance, skin type and wet vs. dry options. How to Choose the Best Electric Shavers? This electric shaver which is also known as SensoTouch 2D, is a Gyroflex 2D defined technology that gives the best skin care comfort with a completely close shave. Its precision trimmer is best for mustache and sideburns. It comes with a power cord, protective cap, electric shaver, click-on precision trimmer head, cleaning brush and charging stand. For optimal results, switch replacement head every twelve months with RQ11. This Philips electric shaver consists of two type; wet or dry. With a smooth surface that has rounded edges to give maximum close shave with little or no irritation. Its rechargeable battery offers to 30 minutes of wireless shaving one hour after charging. But a four minutes swift charge gives you enough time to shave. It is perfect for sideburns and mustache grooming/trimming. The Gyroflex 2D technological define provides maximum skin comfort. Its shaving head effortlessly adjusts itself to every curve of the fact reducing irritation and pressure. Its dual precision heads shaves both the shortest stubble and long hairs. It ensures a smooth, close and easy shave. If you are looking forward to experiencing a smooth close shave, then this Philips Norelco electric shaver may be your best bet. The Gyroflex 2D technological define guarantees maximum skin comfort. 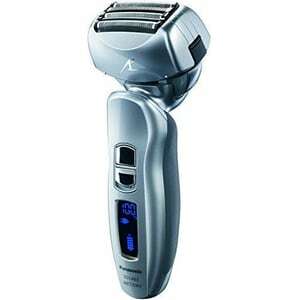 Its gentle on sensitive skins, especially the neck area, and its precision trimmer is perfect for sideburns and mustache. Users still not experience itching, burns or ingrown hairs after shaving. It is also convenient for travelers. However, be mindful of its cable, trimmer and charger (power button). So, you do not accidentally set the power button on. It has length settings which allow you have the flexibility needed to create any look you want. It fits perfectly in your hand thanks to its curved nature. It has just one power button which is at the front of the shaver. There are also 3 indicator lights on the front shaver. It displays battery charging, low battery level, and control panel. The control button allows you to disconnect the power button to prevent it from turning on accidentally. It offers 2D define technology for maximum performance and reliability. Its two-dimensional system slides smoothly to every curve. This, in turn, reduces pressure and irritation on the skin. This shaver is very mild and comfortable when used on the skin. It gives a clean shave with less irritation. It can be used with your favorite foam or in the shower. It’s very easy to clean. You will hardly get a smooth shave. There’s a slightly rough feeling after shaving. The trimmer is good, but when placed at the lowest level, it causes itching on your face. It is highly recommended when you want a trim but you are not too keen about a smooth shave. There are different Norelco shavers on the market and they are all sold at available prices. Philips Norelco 1290X/46 Shaver 8800 is one of the best quality shavers on the market that will offer any man a satisfactory shaving experience. So far it has an average customer rating of 4 out of 5 stars which means more than 90% of its users are happy. The Philips Norelco 8800 is a sleek looking shaver with quality body construction and a rubberized handle that offers a firm grip even in wet conditions. The box comes with the Shaver 8800, a charging stand, luxury pouch, protective cap, power cord, and a cleaning brush. Patented lift and cut system. The shaver has state of the art Gyroflex 3D system which operates as three dynamic parts flexing inward, outward and around to follow the contours of your skin while reducing pressure causing less skin irritation. It also comes with ultra track shaving heads that work super-fast and cover 50% more skin than the average shaver. Even better is it patented lift and cut dual blade system that lifts and cuts hair below skin level. Philips Norelco Aquatec technology allows you to shave with gel, foam or after a shower with adequate skin protection. The Phillips Norelco 8800 offers one the best shavers you can find if you want a comfortable and close shave. Its one of a kind shaving heads are designed to follow the contours of the skin for a perfect shave. It has a very modern look that will attract any man who appreciates style. It’s also very durable and will survive some rough handling. 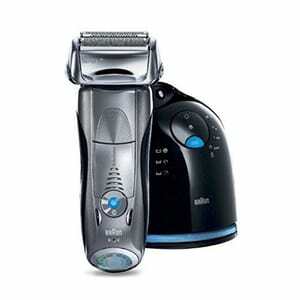 Compared to previous Philips Norelco shavers the 8800 is best in grooming sideburns and mustaches. This is because it comes with a pop-up trimmer that efficiently trims and styles beards precisely the way you want. The shaver comes with 45 days risk-free trial and a full two-year warranty. The standing feet for the shaver are not well designed and feels a bit unstable when you place the shaver on it. This shaver does not conveniently allow cordless usage. To shave cordless for 60 minutes, you would have to charge for about an hour and for a quick shave you would need to wait for a 3-minute charge. This might be inconvenient if you are in a hurry or forgot to charge. In this case, you would have to shave with the shaver plugged into a power outlet. As great as the 3D rotary system is, it can be quite a hassle when it comes to cleaning. You would need to open them separately for cleaning after each shave which can be time-consuming. This shaver has some unique features that make shaving more comfortable and clean. 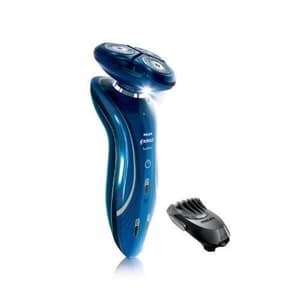 It is best for men with sensitive skin who need a shaver that gently and quietly does the job. This is an upgrade from the Braun series 5 which has advantages being the most recent model. It is comfortable around the neck area. In addition to that, it also cuts the flat hairs also around the neck area which are often difficult to reach. What separates this from the rest is the OptiFoil. This is able to cut the shorter hair for a smoother look. It also lubricates the face, which is a unique feature that sets it apart from the rest as well. This ensures that it leaves the skin being more hygienic during the day, free from any bacteria spreading. There are 3 settings to use, depending on the sensitive nature of the skin. 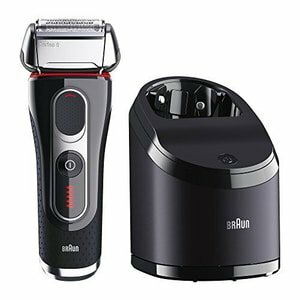 The Braun series 7 is able to eliminate more hairs quickly and effectively, without leaving a rash. It is more personal, because it is adapted to the sensitivity of the skin and is powerful at the same time. It has settings available where you will need to get rid of thicker hair. This is the smart shaver. It is fully waterproof, which is obviously helpful when you are leaning over the bathroom sink. The battery lasts for 50 minutes, which is usually plenty of time for the average person. The customer reviews on average are mostly very positive with regards to the Braun series 7 electric shaver. People want to know that they have spent their money for a valuable product. It is often a case of you pay for what you get. People don’t want to feel as if the product is going to fall apart. The fact that the shaver is solid and sturdy is a bonus. It does not feel as if it is going to slip out of your hands. This is an important factor because this can cause dangerous accident. People enjoy the smooth shave with the various personal settings. The fact that it is able to do a good job take away fine hairs off the chin and neck is another reason why many people enjoy the shaver. Individuals may avoid it because of the expense, but when comparing it with other razors, you also have to look at the various features and the durability. The razor stands out with the OptiFoil feature. It has three settings to choose from for speed. Sonic technology is also an advantage here. It is more expensive than most of the other electric razors on the market. Some people who are traveling a lot may have trouble with the fact that it lasts 50 minutes. However, this is something that one can get around. 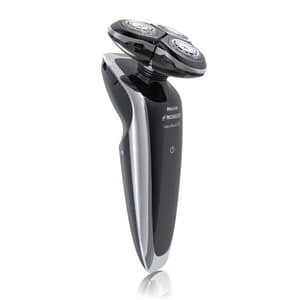 The Panasonic ES-LA63-S Arc4 electric shaver is made for the purpose of close, precision shaving. The ES-LA63-S is powered by a Li-Ion battery supporting extra-long life. The shaver takes about an hour to charge fully and allows you 45 minutes of shaving time. For optimal performance, it is built with a high-velocity 14,000 CPM dual action motor. The four Panasonic blades are whetted to a 30° edge for remarkable sharpness and durability. An inbuilt LCD display helps you to know how much charge is left so that you plug it in at the appropriate time. It features a Sonic Vibration Cleaning system that ensures your razor is clean at all times. The ES-LA63-S is 100% waterproof allowing you to shave in the shower. The power switch lockout for travelers ensures that your razor is not accidentally activated in your suitcase leaving you with an empty battery. A pop-up trimmer supports the easy shaping of your mustache, sideburns, and beard. The exceptional four blade design ensures a smooth shaving every time. The Multi-Flex pivoting head allows the foil to maintain the right contact with your face guaranteeing the best possible shave. The 14,000 CPM motor makes it possible for the blades to move fast so that your hair is pulled out but properly cut. The ultra thin foil ensures that the shave is as even as possible with an electric razor. The reviews for the Panasonic ES-LA63-S is very impressive. 66% of users rated it five stars and 85% gave it four stars or better. There were few complaints but overall customers were satisfied with its performance. The ability of this shaver to cut through thick hair and still leave users with a smooth skin was extolled by reviewers. Unlike previous foil razors, you do not need to dig out a blade if you fail to shave for a day or two. The ES-LA63-S is also effective with beards that grow out in different directions. For a long time, only rotary shavers worked for beards that didn’t grow out straight. 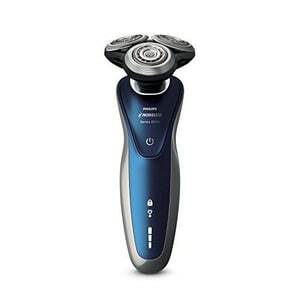 The high-speed motor ensures that your beard is evenly cut and not pulled out. The charge allows for a week of shaving which means that you can go on short trips without the AC adapter. The greatest complaint was that the broadness of its head making it difficult to get to some areas of the neck. However, this is the price required for the smooth shave provided by the four blade design. Another complaint is that the razor does not function when plugged in. This helps to protect those who would try to use the razor in the shower while plugged in. The motor noise is louder than that of other razors. This is because of the extra speed of the motor. There only little that can be done to reduce the noise. The Philips Norelco Shaver 9300 is an advanced shaver with Contour Detect Technology that enables the shaving head to move in 8 directions, cutting up to 20% more hair in just one pass. The V-Track Precision cuts your hair up to 30% closer. The exceptional Contour Detect Technology enables the shaving head to move in eight directions carefully following every curve of your face. The Shaver 9300 features a relaxed speed for a slick shave, a high speed for a comprehensive and smooth shave and a medium speed for thorough and even shave. LED Display – The advanced led display shows your battery status, cleaning indicator, travel lock indicator and a replacement head indicator. Lithium-ion Power – It is powered by Lithium-ion battery that can last for up to 50 minutes after a one hour charge. Also, the five minutes quick charge allows you to get a quick three minutes shave. AquaTec Technology – Shaver 9300 ensures a comfortable and dry shaving experience or a fresh wet shave with shaving gel. Deluxe Case – The premium case of this shaver has a brilliant design that occupies less space in your suitcase, and its built-in ventilation chamber allows your shaver to stay dry. SmartClean System – This allows for easy maintenance: charges, cleans, dries and lubricates your shaver. The review of the Philips Norelco Shaver 9300 is positive. About 57% of the customers gave the product five stars more than 70% rated it four stars and better. This indicates that the functionality of the item is up to par. There were, however, a few complaints but on the whole, the Shaver 9300 exceeded the expectations of many customers. The shaving heads of the Philips Norelco S9311/84, 9300 Shaver can move independently in 8 different directions ensuring a smoother and cleaner shave. The V-track precision blades provides a 30% closer shave leaving you with a smoother surface. The auto cleaning cradle ensures that the razor is clean at all times. The lithium-ion battery supports long battery life and allows you to have many sessions with a full charge. It also requires a short time to charge. The built quality is durable and the features and appearance of the shaver 9300 is modern and advanced. The biggest drawback is that it is quite expensive costing more than $200. The price might be on the high side but be assured that you will get what you pay for and even more. The travel case that accompanies the shaver does not have sufficient space to carry both the cleaning cradle and the power cord. There is less of a rash and skin irritation when using the Braun series 5 electric razor because of the FlexMotionTec feature. The clean and charge and station is something that helps lubricate the skin which is very useful against infections, and simply helps one feeling that the skin is smooth after a shave. People find that it is easier to get rid of flat hairs which are not always to get hold of with other razors. These are often hidden away under the neck. The razor is powerful enough to scoop these away in one motion so you are not left with a rash. It is designed to be comfortable around the chin and the neck. You don’t have to apply a lot of pressure to get rid of hairs which are normally hard to reach. UltraActiveLIft with Cross Hair Blades will attend to hairs which are more problematic, especially in the neck. The cleaning program is one of the main features which is simple to put into action. It lubricates the skin with an alcohol solution so skin becomes more hygienic during the day. A trimmer is perfect for the individual who has a moustache or other facial hair and needs this to be shaped accurately. It takes 5 minutes for a quick charge and 60 minutes of shaving time until you have to recharge the battery again. A full charge of the battery will take just under 2 hours. Although there are people who say that this was an expense, at the end of the day, you will have to weigh up the pros and cons. You have to ask yourself what sets this apart from the rest. Many people have been happy with their purchase because of the features that the Braun Series 5 has to offer. People often look for a quick shave which is comfortable and effective. When you want to shave quickly and you are in a rush, you are often left with a cut or a rash because you are not focusing on what you are doing. However, this electric razor is more accurate, gliding over the contours and delivering a smooth shave. It gets rid of the hairs in a single stroke. It doesn’t leave you looking as if this has been rushed because of the clean and charge station. FlexMotionTec is a feature that is very useful that will glide along the contours of different areas of the face which are normally difficult to reach. The razor is designed so that it is able to reach the smaller as well as the larger contours. A simple button is available to adjust this setting. Convenience of the clean and charge station. Powerful compared to many electric razors. Comfortable, easy to grip and durable. FlexMotionTec leads to less irritation. More expensive than a lot of razors on the market. Cleaning solution cartridges can add to the costs and sometimes frustrations. This is a well-designed electric razor which is comfortable to grip. It is small and thin, so it easy enough to pack and take away with you on business travel or personal vacations. This makes it very convenient. It glides over the contours of the face easily and gently, reaching all of the touch spots which are usually hard to reach. This is made possible with the flexibility of the head of the razor. It gives you a quick shave without leaving you without any rashes or cuts which is what often happens when you are in a hurry. It is also waterproof, which makes it convenient for when you are in the shower. You will be able to see the status of the battery with the LCD which pops up. The main features that stand out with the Panasonic ES8243A Arc4 are the four blades that have been designed to be very powerful and accurate. The 30 degree nanotech system allows for all hairs to be attended to, whether they are standing up straight or they are lying flat under the chin and are more difficult to get to. There is also the option to have a wet shave which some people find to be more comfortable, applying shaving gel, and taking more time with this. The motor has been well designed to give you a shave that is quick. It moves quickly around the contours of your face. It doesn’t take a long time to recharge. These are features that have been improved upon since the previous model was released. The trimmer is another feature that is useful which pops up and will help you style your mustache or facial hair. On average, customers have been happy with the purchase of this razor, because of the features that it comes with. It is particularly useful for folks with more of a sensitive skin because you will feel more comfortable, knowing that it doesn’t leave you with a rash. People like the fact that they can switch between a dry or a wet shave when they need to. 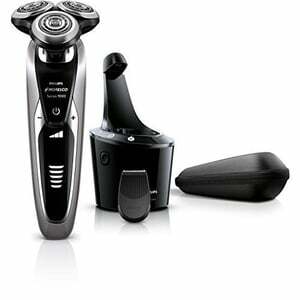 Many people also enjoy something more powerful where they are getting their value for money, and this is where this Panasonic shaver model does stand out. Powerful motor, delivering a quick shave, especially when the dry option is selected. No razor cuts or burns. It is well designed and compact as well as comfortable. Some people find that the power button should be placed somewhere else as it can interfere where the thumb is placed. The S8950/91 electric shaver from Phillips Norelco is a sleek looking almost futuristic model. The manufacturer makes claims that the shaver will remove more hair than comparable shavers that are in the same price range. The triangular design of the three head shaver is designed to pivot and move with the odd contours and angles of any face. The shaver is designed to work with and without shaving cream. It is also water resistant. The package comes with batteries, the shaver, carrying case, a charger, and instructions. The shaver is self-cleaning. The shaver is small and light weight so it is easy to handle. Three rotating heads with stainless steel blades. Can be used dry, wet with water only, and with shaving cream. Flexible pivot of the heads at one point and individually allow better fit to facial contours. Self cleaning without special cleaning solution. LED battery charge display on front of handle. The S8950/91 electric shaver from Philips Norelco lives up to the majority of the manufacturers claims but not all of them. I found the dry shave to be less satisfactory than the wet shave. Shaving with cream produces the best shave. The effect of the cream may be the most important factor. The shaver dries itself well. I wonder about the effect on battery life but have seen no undue loss of battery performance. The batteries are a tad of a task to replace but not a deal killer. You cannot tell what the charge level in the shaver is while you are shaving. The placement of the charge LED seems to be designed to be used before and after shaving only. The shaver can charge up really fast for a single shave but it may take two hours for a full charge. The full charge will last about a week just like Phillips Norelco claims. The carrying case seems like it could tear easily or be deteriorated by some bath chemicals but I have not seen this happen. There is no guarantee for the blades. All in all I feel the shaver is worth the cost. The flexibility in the head is unique and the shave is close. Charge can last for a week if shave once per day. Shaves as well dry as wet. Pivots fit facial shape producing less effort in shaving. No special cleaning fluids needed. Must use water to remove shaving cream and some hair build up. Replacement batteries are specific and expensive. Warranty does not cover blades. Self cleaning does not remove shaving cream. As stated above, some factors have to be considered before getting an electric shaver, to get the best out of your shaving experiences. As there are hundreds of models out there, each claiming to the better than the rest, having a guide would help narrow down your choices as you would know which one would be better suited to meet your shaving needs. Most people do not know how to make a choice while putting all of these into consideration. Therefore, anyone who does not know how to go about getting an electric charger would find this article very useful. Electric shavers do not come cheap. This does not mean that you won’t see one that is not affordable, but with those, durability is not guaranteed. It would be wiser to get an expensive but very durable charger than wanting to save more to end up replacing your shaver the next year. In the end, though, checking your budget before making a choice is important to avoid going for something that would make a huge dent in your pocket. Even those cheaper shavers have grades, so be sure to research carefully before choosing which one to buy. These two types of electric shavers have been explained above, so go for the one which suits your skin type or shaving preference. 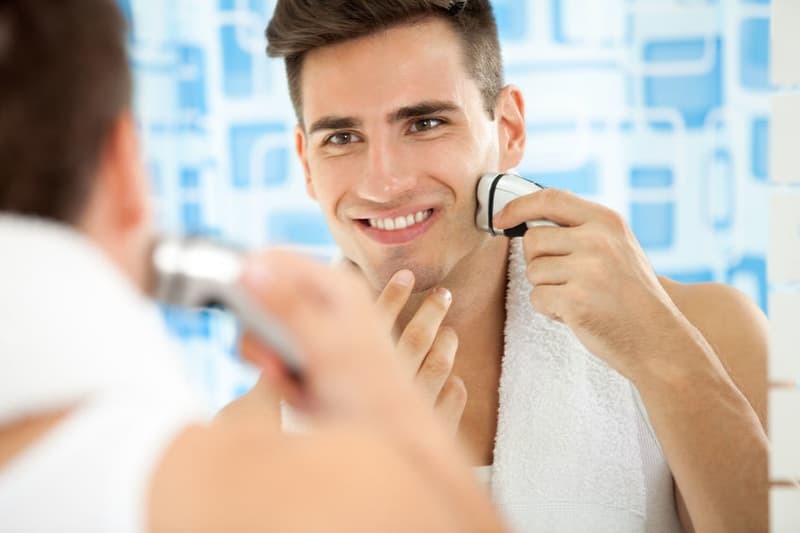 Rotary is not the best choice for someone with sensitive skin, while a foil shaver is not a good choice for someone who does not like the clean-shaven look. This factor should not be overlooked. Especially for those with sensitive skin or people who are prone to infections. It is easier to clean up a foil shaver than an electric shaver. Some shavers come with in-built cleaning options while some are built to clean themselves when dirty. Those with sensitive skin need to apply shaving creams or gels before shaving, so they should go for shavers that have the dry/ wet option and not just any electric shaver. Electric shavers do not all have the same power type. There are battery powered shavers; some come with charging units which can be plugged in while others have cords. Battery powered shavers are the best for people who travel often. But, they cannot be used daily without replacing the batteries frequently. Plug-in shavers can go for up to an hour or more if properly charged before use. Meanwhile, corded chargers are gradually becoming a thing of the past as the cords usually get in the way and slow down shaving time. Electric shavers require blade replacement at least, on a yearly basis. If an electric shaver is expensive, then by default, it’s replacement blades would be expensive as well. Now, below are some important guidelines to getting an electric shaver that would meet your requirements and also be pocket-friendly, especially, for those looking at cost. There are two primary types of electric shavers. Though they work differently, both give precise cuts in their unique ways, and the type a customer chooses depends on their skin type and preferences. Therefore, their peculiarities should be known in other to make a choice that favors the user. Rotary shavers rotates to move in tune with the shape of the face. It is called ‘Rotary Electric Shaver’ because of this. It is made to accommodate three, sometimes four heads; to which razors are attached. These razors are designed to move around in spinning motion, and a grid holds them in place from underneath. For people who have long or very tough hair, rotary shavers are the best choice. This is because of the spinning motion of the razors, in circles, make them able to get to every part of the face like underneath the chin. Those who do not often shave would prefer this shaver because no matter the length of hair, it would tackle them when used. This type of electric shaver does not give the clean- shaven look, though, so anyone looking to get rid of the tiniest hair strand should not get a rotary electric shaver. Foil Electric Shavers is crafted for those who have overly sensitive skin and are prone to irritation after shaving. The ‘Foil Electric Shaver,’ might look like any other shaver but it is not. It has a very thin metal beneath the blades. It has two or three blades on the head that are made for gliding. This makes it able to give clean cuts very close to the skin without causing irritation. Also, it’s closeness makes it able to give sideburns and hairline edges definition, without mistakes. It is also a preferable choice for people who shave daily or those who love very clean cuts. Why are electric shavers superior to other kinds when they all give a shaven look, you might ask? Well, there are several reasons why you should ditch traditional razors for an electric shaver. Outlined below are some great advantages of electric shavers. 1. Precision-Electric shavers are built in such a way that while shaving, the razors cut precisely, without hurting you, to give a clean look. 2. Ingrown hairs are now a thing of the past. Electric shavers raise up hair strands before cutting, making it the hair unable to grow into the skin while growing back. 3. Versatility – While people, especially women shy away from using razors on other parts of their body because of the fear of cuts and ingrown hairs, using electric shavers guarantee that none of this is experienced. They can be used to remove hairs just about anywhere; scalp, face, legs and even the body. 4. Speed- Electric shavers are automatic and therefore, faster to use than razors. All you need do is power it on and glide across required body part. Most of them cut in such a way that you would not need to go through the same area twice in one shaving session. 5. They save money. With a good electric shaver, you do not have to use cream while shaving if you don’t want to. This saves money that would have been used for regular shaving cream purchase. 6. With an electric shaver, it doesn’t matter if it’s your first time or you are a pro at shaving. Unlike razors which would cut a newbie in several places, all one needs do while using an electric shaver, is position the shaver to the areas they need to shave, and it does the work. 7. Using a razor means replacing blades for each use, but with electric shavers, a set of batteries can be used several times and if it requires a power outlet, then better. In fact, with plug – in shavers, you can charge anytime and use whenever you are ready. 8. In the long run, electric shavers are cheaper than traditional razors. The latter needs to be replaced after each use, but an electric shaver can last from ten to twenty years. 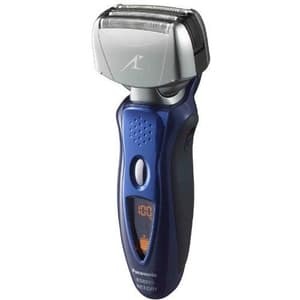 Therefore, you cannot compare the price of using a cartridge razor in a year with the price of an electric shaver which wouldn’t need to be replaced in decades. Even if you replace your shaver blades every year, it is still cheaper in the long run than razors. 9. Unlike razors which require wet shaving to get a clean shave and prevent irritation, electric shavers give the option to choose. If you don’t like wet shaving or don’t like running late and cannot be bothered to cream up, you can conveniently purchase an electric shaver with the wet/ dry shaving option and still get great results. Which are the best electric toothbrushes available in 2019?